New to smoking, purchased Yoder this past October. So far, after following all instructions, everything is coming out really dry. Any suggestions? Need to know more about your processes and products you are using to be able to help. Turkey, Chicken, Tri-Tip, Pork Ribs...etc. The Prime Rib did turn out ok. Typically watch some videos using Yoder smokers and duplicate the cooking process. Nearly every time, this smoker is working like a dehydrator versus what the videos are showing the final product is supposed to be like. What temperature are you cooking at? Top shelf, lower shelf? Do you brine? How long are you seasoning the meat prior to putting it on the cooker? Are you waiting 30 to 40 minutes before putting any meat on the cooker, so the cooker can complete the heat up cycle? When do you take the meat off tge cooker, by internal temperature, feel or???? Each time is different as the meat is different and the instructions I look up are different. An example, yesterday pork baby-back ribs. Marinated for about two hours (teriyaki/brown sugar), put on smoker at 170 degrees for an 1 1/2 hours. Removed, laid on tin foil, added some more marinade & apple juice, wrapped and put back on at 250 degrees for 3 1/2 hours. Opened tin foil put a little more marinade on top, sprayed all with apple juice, left tin foil open and left on for another 1/2 hour. Meat was very dry. First off, the quality of the meat is key. If the meat is of lesser quality, no matter what you try, you will not be able to compensate. The marinade you used will actually start to cure the meat. You should have noticed that the surface of the meat changed in texture to a more hard texture, rather than the soft meaty texture. You did not specify what seasoning you put on the meat, or how long after putting the seasoning on tgat you put the meat on to cook. Look at any of the rubs you have purchased, and the number one ingredient will be salt or sugar. The longer you let the meat set with salt or sugar on it, the more moisture that eill be drawn out if the meat. I don't cook any thing at less than 250 degrees, and actually cook ribs at 275 degrees. Any poultry is cooked at 325 to 350. Brisket at 250. 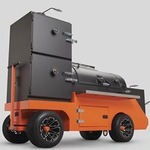 I woukd suggest that you take a look, and search for recipies and procedures, at http://thesauce.atbbq.com, where the bulk of everything is cooked on a Yoder Smokers pellet cooker. Thanks for the reply. I have done these ribs in the past, nearly identical, in the house oven and had much better results. I will continue to experiment until I get it.